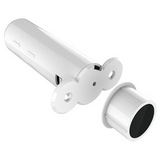 The Vision Z-Wave Plus Recessed Door/Window Sensor is a small, wireless device that detects the opening and closing of your door/window. It has two pieces: a larger part (transmitter), and a smaller part (magnet), which will be inserted into your door and door frame, making the sensor almost invisible. Visible parts comes in two colours - white and brown in one package. It works similarly to Door/Window sensors, but has to be installed inside a door frame to keep it hidden from the view. They are more difficult to mount up and require to drill holes for installation. The Vision Z-Wave Plus Recessed Door/Window Sensor uses a replaceable lithium battery and should last 2 years under normal usage. This product can send binary on/off commands wirelessly using a Z-Wave enabled (AUS/NZ version 921.42 MHz) transmitter to assigned controllers, switches, dimmers, blind controllers, fans, power boards, locks etc. The sensor can be used to automatically turn on lights, turn wireless switches ON/OFF and for security applications within the Z-Wave network.